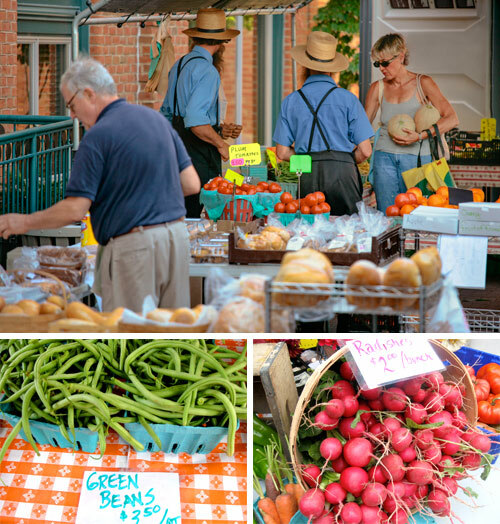 Kennett Square Farmers Market | A Decade of Delicious! Listen to the sounds of “I Am Love” and “Vita and the Wolf” while shopping this Friday at the Kennett Square Farmers Market. First Friday at Market brings several special guest vendors, in addition to our regular First Friday line-up (see below for a complete listing) including Heirloom Jewelry and Temporary Tattoos and Spodee Spirits by Quaker City Mercantile. Happy Cat Farm returns with their inspired selection of seeds, plants, and produce. Read Tim’s blog for Williams-Sonoma about heirloom tomatoes http://blog.williams-sonoma.com/how-to-grow-heirloom-tomatoes/ for a sense of what’s to come! Rambling Roots Farm will have their delightful cheddar cauliflower, broccoli, napa cabbage, spring mix, spring onions, radishes, beets, chard, kale, parsley, strawberries, and mushrooms from Cordivano Brothers. We offer a recipe below that will work well with their buttons or portabellas! Rex Farm Orchard will bring all the strawberries you could ever desire, in addition to their broccoli rabe, asparagus, red beets, apples and jarred goods including honey. Londonvale Farm Produce will add shelling peas, carrots, cauliflower and broccoli to their usual line-up this week. Note: Londonvale will not be bringing strawberries, so be sure to visit Rex Farm for your homegrown supply! Papa’s Pastry Shop creates the most refreshing watermelon drink that is perfect on a hot summer day. Stop by and discover that they are not just about pastries (although their cookies, cakes and breads are wondeful). Taste Artisanal features a delicious fresh Arugula Pesto made with local organic arugula from Sunnygirl Farms in Kennett Square. Mmmmm! on pasta. KAS Cake Emporium will have “on tap” the finest of their cakes, in generously sliced portions: coconut flan, pineapple coconut cake, fresh carrot, banana walnut cake, tre leche, fresh lemon meringue pie, and don’t forget their famous spicy meat pies in beef and chicken! And yes, strawberries are HERE!!! Fresh, seasonal berries are so delicious, but they’re also quite delicate. There’s nothing more tragic than buying a pint of local berries, only to look in the fridge the next day and find that fuzzy mold growing. Here’s a tip on how to prevent the mold: Wash them with vinegar! When you get your berries home, prepare a mixture of one part vinegar (white or apple cider work best) and ten parts water. Dump the berries into the mixture and swirl around. Drain, rinse if you want (though the mixture is so diluted you can’t taste the vinegar,) and pop in the fridge. The vinegar kills any mold spores and other bacteria that might be on the surface of the fruit, and voila! Raspberries should last a week or more, and strawberries go almost two weeks without getting moldy and soft. Enjoy! Lettuce tell you. It’s probably thyme that we begin to talk about produce. We carrot believe it’s May and we’ve bean meaning to feature the vegetables. How long dill we wait? Happy Cat Farm will be with us this week, featuring the cream of their tomato crops. This is the place to stock up on heirloom, hard-to-find tomato varieties for your garden. 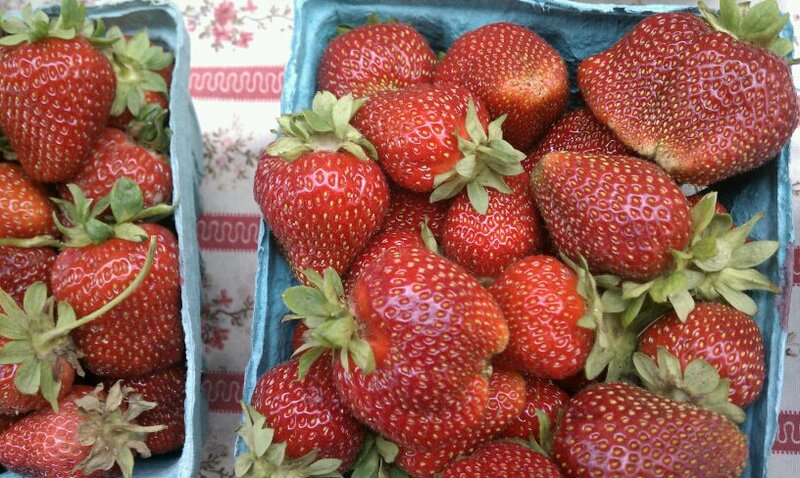 Rex Farm will have strawberries, Come early, as they will go quickly. Also find broccoli rabe, asparagus, and their delicious apples and apple products. Rambling Roots Farm will also have strawberries and then spring onions, lettuces and other bagged greens, chard, radishes, and mushrooms. Their radishes are especially mild right now. London Vale Farm brings wonderful fresh produce and a variety of herb plants. :ook for collard greens, snap peas, cucumbers, green onions, kale and lettuce. Also, free-range eggs! Vera Pasta (bi-weekly vendor) will have their different flavors of penne pasta (have you tried their sriracha pasta? ), pappardelle, linguini, fettucini, and more, including their yummy marinara and gravy. Shadygrove Greenhouses will have their bounty of hanging plants, perennials, bouquets and more for your garden or centerpiece. Look for Daniel in a new spot, with more space: still on State St, just moved down slightly towards the intersection of State and Union. Meadowset Farm announces that Camel’s Back is BACK! This cheese is a more mild, nutty, Basque-style mini tomme that is the perfect snacking cheese, and the kids love it. Try it tomorrow at market! Also find their grass-fed lamb (ground & chops), beef (ground & pre-made burger patties), and The Last Straw, a hard pecorino-style artisanal cheese. Crossan Kettle Corn features a Memorial Day special “Patriotic Kettle Corn,” in addition to their usual selection of sweet cheddar, cinnamon, honey mustard, crab-seasoned, and herb. Buy some for the parade or your cook-outs! Don’t forget the Kennett Food Bank accepts food and cash donations every week at Market. The need for food continues and actually increases during the summer months when children are no longer in school. Thank you! 2. Go Early or Go Late – For the best selection, especially for popular-but-limited items, arriving early at market is a must. For the best deals, vendors are often willing to discount items at the end of the day. Markets tend to be less crowded at the start and end of the day, as well. 3. Bring Big Bags and Small Change – Using heavy-duty reusable bags is good for your purchased items and good for the environment. And having the smaller bills and change simply helps your transaction go quickly and more smoothly. Having a cooler available, in case you aren’t going home immediately, is another helpful tip. 4. Plan for Spontaneity – Be willing to experiment, try a new food or select an item you didn’t expect to find. Often the vendors will offer samples or advice on how to prepare something new. 5. Work in Volume – When it’s peak season, you want to take advantage of those great flavors and prices. Besides trying more new recipes, consider freezing, canning, drying foods for later in the year. 6. Think Whole Foods – Remember that carrots come long and unpeeled, beets have greens and maybe some dirt attached. It may look slightly different than at the grocery, but it is worth it. 7. Take Your Time – Browse the market slowly, seeing all there is available. Make this a time to socialize with the vendors and other like-minded shoppers who appreciate the opportunity to shop local and fresh foods. Tis the season for plants, plants plants! You will find a plethora of beautiful items for your home and garden at market this week. Nick Castelli’s Plants carries colorful annuals and perennials, in addition to his wonderful succulents. Shady Grove Greenhouse returns for the season with tons of seasonal plants. Hanging baskets, bouquets, decorative pots, starter flowers and vegetables, shrubs, and more! Chansonette Orchids has exotic plants in all shapes and sizes, from classic to funky. Rambling Roots Farm will have spring onions, lettuces and other bagged greens (arugula, spinach, spring mix, and baby kale), chard, radishes, and mushrooms. Their radishes are especially mild right now. London Vale Farm also brings a variety of herb plants, plus more fresh produce – look for collard greens, snap peas, cucumbers, green onions, kale and lettuce. Nomadic Pie Truck celebrates her 1 year anniversary this Friday with a free mini pie to her first 20 customers. Be sure to stop by and congratulate Molly on her success! La Cucina Verde (now a bi-weekly vendor) has Kurry Kraut, Moroccan Carrots, and Pineapple-Mango Salsa on the menu this week. Meadowset Farm will have their grass-fed lamb (ground & chops) and beef (ground & pre-made burger patties), plus The Last Straw, a hard pecorino-style artisanal cheese from ewe’s milk. Try a burger tonight, or meatballs with lamb or beef! 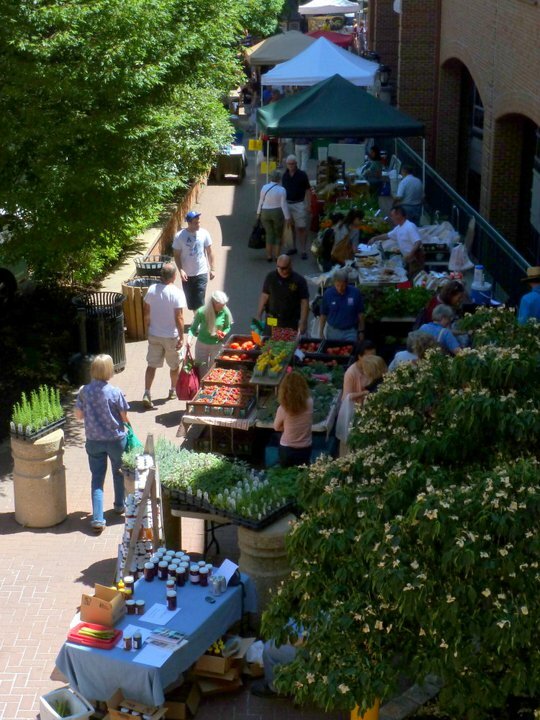 Discover in season locally-grown produce, eggs and honey, meats and cheeses, fresh baked goods and other local delicacies this week at this week’s Farmers Market. Cut flowers and some bedding plants will be available. The cool temperatures may have slowed the growth of produce somewhat this Spring, but you will find that our farmers are beginning to harvest a wider selection of greens this week and a few additional items, as well. The Bayard Taylor Library will hold library card sign ups, plus have tickets and a raffle for the May 31st Home and Garden Tour. Rambling Roots Farm will bring plenty of greens to Market this week. look for bunched and baby kale, chard, head lettuce, arugula, radishes, and spring onions. 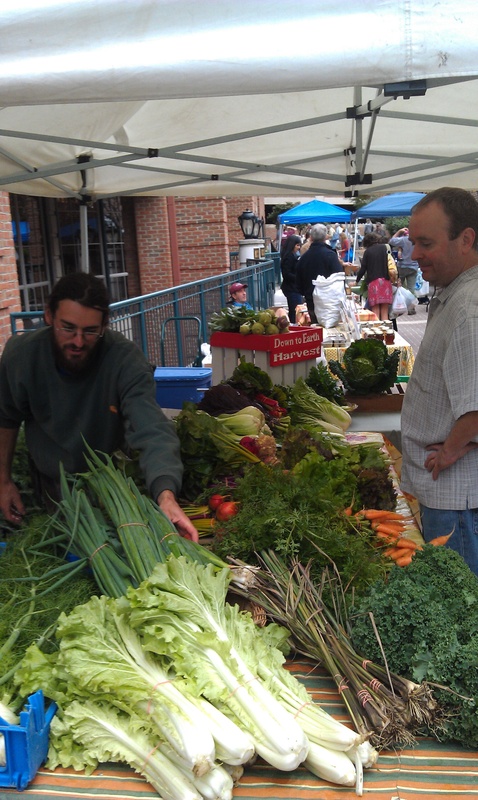 You’ll recognize Phil & Shanna, formerly of Down to Earth Harvest, and you’ll love their produce! Chansonette Orchids is also bringing cut flower bouquets from Schaeffer Flowers in Lancaster, in addition to their lovely orchids. A perfect option for Mother’s Day. Naughty Nutty Love has 6 oz. jars of her freshly ground nut butters in several flavors. Combined withJack’s Jams & Jellies and Big Sky breads, you have a PB&J right on the spot at Market! Sunset Park Gluten Free will have delicious gluten-free coffee cake at Market this week. A perfect combination with Golden Valley Roasters coffees! Philly Bill’s Dills actually comes to us from Doylestown and he requests that you catch him early in the day, as he will be at Market only from 2-4 pm. We are so excited to welcome back all of our returning vendors and customers to the Farmers Market after an overly long winter. While the Kennett Square Market now maintains its presence year-round, there is nothing like the long line-up of pop up tents down East State Street and through the brick walkway during the regular season. People gather at the Market to catch up with friends as well as to stock up on fresh and local foods, plants, and other items. The Bayard Taylor Library will hold library card sign ups, plus have tickets and a raffle for their upcoming Home and Garden Tour. Anita’s Guacamole brings a tasty Guacamango, Cucumber Guacamole, Anita’s Fresh Salsa, and Mango Salsa. A perfect choice for this Cinco de Mayo weekend! Nomadic Pies asks you to stop by the truck and check out the many great flavors, including a delicious new savory pie. Guinea Hen Garden brings their fresh eggs, honey, and herbs. Also look for the 2013 Kennett Square calendar at Wick’s table, filled with fantastic KSQ photos. Taste Artisanal welcomes summer with the first of their summer spread lineups. Returning favorites are the Mediterranean Tapenade, Muhummara, and Slow Roasted Tomato Bruschetta. Will Hurd – Your Personal Architect has a new canopy and signs to welcome the new season. Bring your big and small questions to him, or just visit with him for a moment. Harvest Market, a veteran sponsor of the Kennett Square Farmers Market, will showcase samples of what’s in season and new prepared items available from their new Harvest Market Kitchen. Look for them to return every 1st Friday! Ellen April Soaps is another First Friday vendor who have a large selection of soaps and body products, including their newest soap, Tussie Mussie. On Friday May 3rd, from 2-6pm, the 2013 Kennett Farmers’ Market Season will re-open its weekly schedule after a fantastic winter outdoor market season. This winter, we had the pleasure of welcoming a few new vendors to the line-up: delicious southern-style baked goods and Latin-American cuisine by KAS Cake Emporium; Lamb and Pecorino by Meadowset Farm & Apiary; certified Fair Trade, Organic, locally roasted coffee by Valley Roasters, Sweet Salvation Truffles, Take Me Bake Me pizzas, and apples and more by Rex Farm Orchard. All of these vendors return, in addition to many veteran and some new summer season vendors. Look for handmade pasta by Vera Pasta, artisan nut butters by Naughty Nutty Love, spirited samples by Spodee Spirits, produce by Rambling Roots Farm, pickles by Philly Bill’s Dills, and seeds by Happy Cat. Our returning regular season weeklies, including Flickerwood Wines, London Vale Farm produce, Big Sky Bakery, Jack’s Jams & Jellies, Sunset Park Gluten Free cookies, and Abdel’s Organic Olive Oil promise to bring you the biggest and best market Kennett Square has seen. Harvest Market will also be sampling what’s fresh and available in their market kitchen. Our grand opening on May 3rd will feature live music by the charming new folk duo, Foxhound, a charming new folk music project by Chris Kasper and Kiley Ryan. We return to the 2 pm to 6 pm hours. Parking is available in the adjacent municipal garage off of North Union Street. A huge thank you to our generous sponsors – Lester Water, The Land Conservancy of Chester County, and Harvest Market. Come out to celebrate on May 3rd, then return weekly throughout the season to buy local and stay fresh! Kennett Square’s Winter Farmers Market is winding down and we are looking forward to a fantastic new season of weekly markets beginning on May 3rd. We are excited to welcome back John from London Vale Farm, as well as Dia Doce Cupcakes. Down To Earth Farm has moved to Rambling Roots Farm and will be front and center on State Street. New vendors include Naughty Nutty Love (!!) and Vera Pasta. Take a moment to meet them and sample their products. Market Manager Abby works hard to create a balanced blend and always appreciates hearing your feedback. Stay tuned for the full list of returning and new vendors! 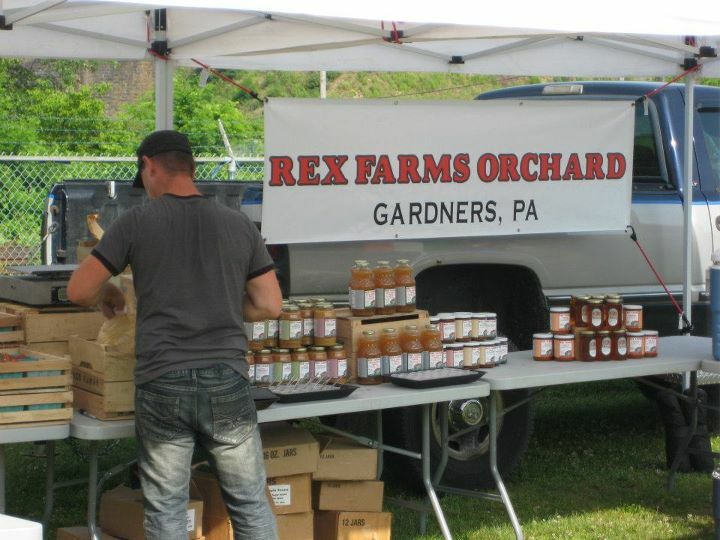 Have you met Troy, owner of Rex Farms Orchard? He has been with the Market all winter and is staying on for the regular season. Besides the very best in tree fruit products (fruits, cider, juice, butters, and sauces), Rex Farms also grows some vegetables. Troy brings amazing onions, using a special curing process that allows them to stay fresh all through the winter. Try the apple salad recipe below with Meadowset pecorino and Abdel’s Olive Oil. Or add a Rex onion to a Maiale salami sandwich served on Big Sky’s hearty bread! Discover the other wonderful items our vendors will be bringing to Market this week. Hope to see you there! Big Sky Bread still makes bread the old -ashion way. This week they promise to bring everyone’s favorite breads, as well as some sweet treats and granola! Sweet Salvation Truffles will tempt you some of their remaining Easter treats at 50% off! Indulge! Golden Valley Coffee Roasters features their locally roasted, naturally grown coffees. Have you tried the Breakfast Blend? It’s worth waking up for! Guinea Hen Gardens raises herbs, chickens, sheep, bees, and their own vegetables. At Winter Market, find eggs, honey, some greens, and herbs. KAS Cake Emporium prepares Southern style desserts, including mouth-watering sweet potato pies, luscious coconut cakes, and fudge. If you don’t see it, ask! Maiale Meats & Charcuteries prepares everything from the salumi to meatballs in house and from scratch. They believe that better tasting food is made from fresh and local ingredients. Meadowset Farms is produces grass-fed lamb and beef, in addition to their superb line of raw sheep’s milk cheeses. Crossan Concessions will bring assorted flavors of their Kettle Corn, including traditional, cinnamon, and sweet cheddar. Look for more flavors to come! Taste Artisanal brings their tasty cheeses and phyllo products, among other prepared items. snickerdoodle. They also do special orders! Abdel’s Tunisian Oils invites you to sample their unfiltered organic extra virgin oil. This is a first cold press oil which generally not available in stores. It has a stronger, fruiter, even green flavor with more olive particles. It is said to be much healthier with higher nutrients and antioxidants. Wash and dry kale leaves. Fold them in half and pull stem out removing it all the way up, even through the bottom part of the leaves where it is thick. Tear the leaves into bite sized pieces or chop the leaves crosswise in 1/2 inch ribbons. Place them in a bowl. Toast almonds in a skillet over medium heat until light brown. Remove from heat and cool. Cut cheese into 1/4 inch dice. Cut apple right before tossing in the dressing to avoid browning. To make the dressing, whisk lemon with olive oil until combined. Add a pinch of salt and black ground pepper. Drizzle dressing on kale a little at a time. When it is all coated, add the cheese, almonds and apples and toss together. Let sit about 15 minutes before serving. It lasts in the refrigerator one day. Enter your email address to subscribe to this blog and our newsletter! Brought to you by. . . The Kennett Square Farmers Market is a program of Historic Kennett Square, a 501(c)3 non-profit here to help support and enrich our small town community! Market Location: 101 East State St.
Mailing: 106 West State St.